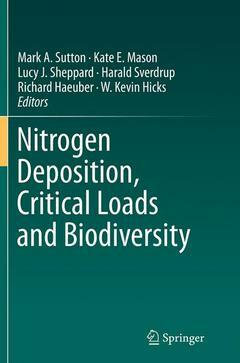 This volume brings together extended reviews and papers of new scientific research on atmospheric nitrogen deposition impacts globally. While there is a wealth of evidence on the magnitude, components and effects of nitrogen disposition on floral biodiversity in Europe and North America, there is an obvious lack of information on impacts on above- and below-ground fauna, and all impacts in other parts of the world, with no clear overview of how the different strands of evidence fit together. This overall synthesis is targeted at the international conventions, but is equally readable for scientists, environmental managers, conservation agencies and policy makers. 'This timely book highlights the global nitrogen deposition problem. Major regions of the world are exceeding sustainability thresholds for adverse effects on ecosystem function and biodiversity. This highlights the importance of ongoing work, including under the Convention on Biological Diversity, in developing indicators and monitoring nitrogen deposition effects to enable appropriate measures. 15 What Happens to Ammonia on Leaf Surfaces? 45 The Convention on Biological Diversity: How does Nitrogen fit into the Plans?